This scenario sounds impossible, but has come about because Henry is the first person in the World to be diagnosed with a genetic condition called Chrono-Displacement Disorder. In other words, he is a time traveller. Time travel is a premise that has been used before in countless books, usually with the protagonist travelling through large chunks of time, back into the past or into the distant future, through some magical or technological means. For Henry, however, time travel takes place mostly within his own life span and by a means he has no control over: periodically, his genetic clock resets and he finds himself pulled unwillingly through time, often to points of great emotional gravity in his life. He may be gone for minutes or days by present chronology, but sooner or later he is sucked back to his own present and deposited in roughly the same location that he left. If this didn’t complicate matters enough, nothing may travel with Henry as he moves through time; some mechanism automatically removes anything that isn’t part of his body as he travels (even his dental fillings). The result is that every time Henry travels, he finds himself naked and disorientated in an unknown time and place, forced into hiding, stealing and mugging in order to clothe and feed himself whilst away from his present. He is frequently forced to relive terrible events from his past as a spectator, unable to change anything in a “Quantum Leap” style, as once something has happened one way in time, it cannot be re-written. Time travel isn’t entirely a curse, though. As well as being drawn back to unhappy points in his past, once married, he also finds himself visiting earlier versions of his wife in her childhood home. This is where Clare falls in love with Henry, meeting him in the meadow behind her house at irregular intervals between the ages of 6 and 18, before catching up with the present day Henry at the age of 20 when she moves to Chicago. 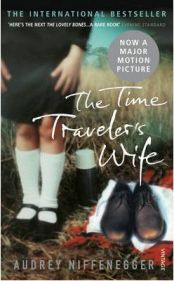 “The Time Traveler’s Wife” depicts the effects of time travel on Clare and Henry’s marriage and passionate love for one another as they try to live normal lives, hold down jobs and pursue a family of their own, while Henry continually vanishes through time, leaving Clare abruptly behind. The story is told from both of their viewpoints. The book may be about Clare in the title, but as their lives merge it becomes about both of them. We hear a first person narrative directly from the time traveller himself, whilst also hearing what it is like to be left behind, covering up and explaining and just waiting every time your husband spontaneously vanishes for him to return. As Clare puts it: “Our life together in this too-small apartment is punctuated by Henry’s small absences. Sometimes he disappears unobtrusively; I might be walking from the kitchen into the hall and find a pile of clothing on the floor. I might get out of bed in the morning and find the shower running and no one in it. Sometimes it’s frightening. I am working in my studio one afternoon when I hear someone moaning outside my door; when I open it I find Henry on his hands and knees, naked, in the hall, bleeding heavily from his head. He opens his eyes, sees me, and vanishes. Sometimes I wake up in the night and Henry is gone. In the morning he will tell me where he’s been, the way other husbands might tell their wives a dream they had: “I was in the Selzer Library in the dark, in 1989.” Or: “I was chased by a German shepherd across somebody’s backyard and had to climb a tree.””. At its core, this book is a love story populated by realistic characters with depth and flaws, and personalities you can warm to and emphasise with. However, there is also an element of science fiction and even philosophy to it, as Niffenegger forces to reader to think about the ramifications of random and uncontrolled time travel. Time in this book is portrayed as being essentially determinist, with the past and future unalterable by any of the actors in it, and Henry frustratingly unable to change things for the better for those he loves. Despite the complexities of these issues and the difficulties of interweaving many threads of plot from different time strands, Niffenegger handles the narrative with a confidence, clarity and assured nature that brings it all together with apparent ease and without any of the pretentiousness you may expect from such an original and intellectual novel. She has clearly thought long and hard about time travel, and has brought a fresh and inspiring new approach to writing about it by bringing us an unforgettably poignant love story told through shifting time periods. Although at times you can tell where the overall story is heading, there are enough surprises to keep you turning the pages. It is very hard to believe that this is the author’s debut novel. There is may be one minor flaw to this otherwise outstanding novel, and that is that only one level of love is portrayed through all the many and various characters. Everybody loves with a consuming passion: Henry and Clare, their friends and family, each one driven or destroyed by their love. There is no middle ground, no one recovering and growing and moving on from their lost love. In my experience, this is not an entirely realistic portrayal. Overall though, this is a book to grab and throw yourself into headlong, a story to thoroughly immerse yourself in. The love between Henry and Clare with make you glow with pleasure, and you cannot help but experience alternate amusement, worry, fear and relief for the characters. It is a book that you will want to devour and will occupy your waking thoughts the whole time you are reading it – and probably for a while afterwards, too. I thoroughly enjoyed and heartily recommend this book; I think Niffenegger is huge talent to keep an eye on in the future. Go ahead. Forget the movie. Read it. It will be time well spent. No Comments on "The Time Traveler’s Wife"